Illuminate & Embody Our 9 Chakras! said that real learning requires integrating head, heart and hands! Please see more student testimonials by clicking HERE. And many more chakra mandala photos can be viewed by clicking HERE. Pamela Pollack ©2011 Throat Chakra adding color! We'll gather, via teleconference and webinar every two weeks for 12 total inspiring and creative classes. We will easily be able to use the technology of the webinar / teleseries format to gather, draw, and share our self-investigation and visual work... and, of course, encourage each other in new ways. This will be an ecstatic, embodied experience, not an 'art class'. Each class will be an energizing, interactive process! You won’t just be sitting while on the phone. We will move, chant, engage in active imagination/ meditation, Sufi practices, participate in co created ritual, and be visually inspired. The groups are very intimate. We will chant, wiggle, giggle, cry, sigh, even dance together! You will feel like we are all in the same room together. Each of the two-week periods will focus intently on our individual investigation, integration, and artistic expression of one of our chakras. There will be 6 mandalas drawn during the first session (more if you like) -- one for your course intention, one release mandala (which we will ritually burn) and each first 4 chakras. There will also be handouts with inspirational exercises, quotes, meditations and music to inspire you in between sessions. We'll launch our shared experience with our first teleconference gathering. During that time, you'll receive visual instructions and techniques for creating your sacred Mandala art. And you'll receive your first set of practices for Embodying and Illuminating the Chakras in our hands. Sessions will be recorded (so if you miss a call you can still fully participate). Time: Calls will last 2 hours and 30 minutes. The last 30 minutes of each call is for drawing together while I play inspiring, energizing music and we continue to resonate together in a morphic field! Classes can be taken "live" as they are recorded in our virtual temple! In the first 6-week series, we will introduce (or review) the Mandala process. We will begin by energizing and illuminating the chakras in our feet as we set out intention for the series, and then move through Chakras 1-4 in the next 4 sessions. We will also create a "release" mandala which we will ritually burn. The second 6-week series will be the 5-8th chakras, an Integration mandala and include a week to embody and illuminate the chakras in our hands as we bring our fully illuminated self into the world! We will close with a final session for reflection and a ritual. Art materials (you'll receive a list of needed materials -- cost is approximately $25). A telephone (a headset or speaker phone is helpful). A digital camera, iPhone, or scanner for sharing mandala images. How to Register: Please click "register button"! If you are not delighted after the first class you may withdraw. *Does not include art materials - approx. $25-30. Payment plans are available by request. Sessions will be recorded, so if you miss a call you can still fully participate! Once you register, you will be sent a list of materials to purchase and have in hand by the first class, and additional instructions regarding calls we will be sent the week before class begins . If you want to see more of my students photos CLICK HERE to check them out! Julia " Mandala" Weaver, LMFT is the founder of Art and Soul, a resource center for sacred and healing arts. While swimming off the Kona coast in 1996, Julia had a mystical experience where she spontaneously received mandala images, which took her into deeper dimensions of healing and spiritual practice. 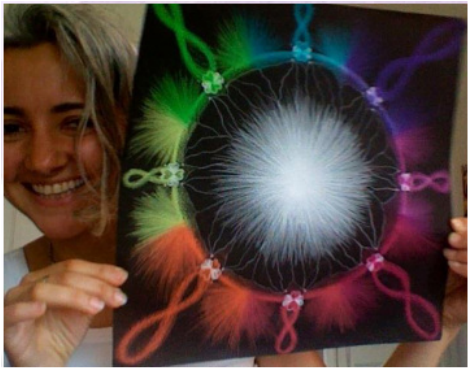 See more of her mandala bio on "home page". I can't wait to share the awakening depth of this dynamic collaboration (I know you can feel it already!) The beauty of our hearts will be reflected back to each other on paper and through our cyber communion. The Mystery promises to reveal new dimensions of healing, rejuvenation and celebration… hope see you in our virtual Temple soon!